* with Lightning Bug Leader who Glows in the Dark! 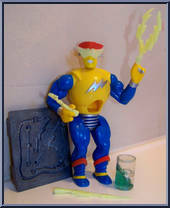 * Goop Power Pack - "Turn me over & see my Goop Power flow!" A floating light bulb and lightening bug hybrid makes this Goop-Mando just "aglow" with possibilities. Always the Mando with another "bright idea", Volt Jolt's special Goopower makes for something really "shocking"! When Volt Jolt yells "charge!" its not about cavalry or credit. 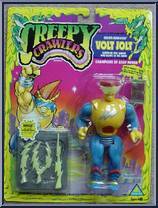 Able to charge up anything and everything electrical, Volt Jolt can also transfer that power directly to C.C. (Chris Carter) who has a heck of a time trying to control it. Lucky for Chris, he is only able to "hold a charge" for a minutes time - and lucky for the rest of us too! Contribute pictures, update details or suggest corrections for Volt Jolt. 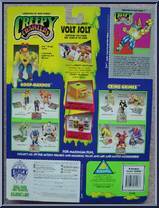 Write a review about Volt Jolt.